Are you ready to save money on your energy bill? Do you live in Sacramento? You’ve probably noticed the cost of your utility bill rising. The traditional energy market is volatile. It rises and falls according to resources and other factors. Do you know what has been consistent for the last two decades? Renewable energy. As the technology has advanced, the cost of solar energy has gradually declined. Solar power systems in Sacramento are affordable. And it’s saving homeowners hundreds every year. So why hasn’t the entire city, state, nation made the switch to solar energy? We believe it’s a lack of knowledge about alternative energy altogether. In this post, we’ll share what you’ll need for a home solar power system. You can find a DIY solar power kit and take care of it yourself. But why waste the time and money “figuring it out” when you could call a solar company like West Coast Solar. We help you budget, find financing, design, build, and install your solar energy system. Once you call us, you’re taken care of. Continue reading to learn more! 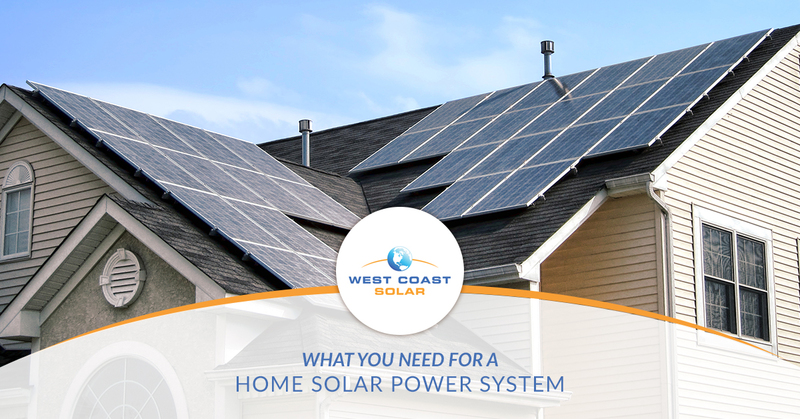 When you call West Coast Solar, we start with your budget. What are you able to afford if your monthly energy bill didn’t exist? We ask a myriad of questions to get an idea on how we can help you get the solar power system you want and need. Eventually, we will come to a general number for what you can afford with a little breathing room. This number will influence the the size and scale of your home solar power system. Finally, we’ll get to the design of the system. Your residential solar power system will involve quite a few questions and extended discussions; however, we take the time before we design your home solar power system to ensure you get exactly what you need and want. We will ask where you would like to install the system and, if needed, where it actually needs to be installed. This can be two different places, based on needed energy production and use; however, we work with our customers to solve this together. Once we confirm a location, we determine the amount of energy you need to power your home, plus an extra 10-20 percent. This will inform how large the system will be, how many solar panels, which type of solar panels, and more. Finally, we’ll confirm all the details and information we’ve gathered from you. Then we’ll start to design your solar power system. A majority of our clients get excited when they see the solar power system design actually being installed on or around their home. Frankly, we get excited, too! The more homeowners we can help make the switch to solar, or any alternative energy resource for that matter, the greater our positive impact on the environment can be. If you’re looking at this list and thinking this seems way too complicated, you’re not alone. These components are actually quite simple and straightforward when installed; however, when it comes to the power you’ll begin to generate, that’s where things get fun. Once your system is installed and working properly, you’ll begin to enjoy producing your own power, becoming energy independent, and having the power to determine your energy bill. What’s more, you won’t only be helping yourself, but you’ll be helping your community by making the switch to solar power. Your home’s carbon-emissions will gradually decline the more you use green energy. For you and the community, alternative energy is a win-win situation. At West Coast Solar, we believe we’re more than a solar power company servicing Sacramento. We’re creating a positive impact on the future of our community and environment. We do more than install home solar power systems for our beloved residents. We change the course of history. We love what we do, and we’re ready to help you make the switch to solar energy. Are you ready to design a solar power system? Call us today!